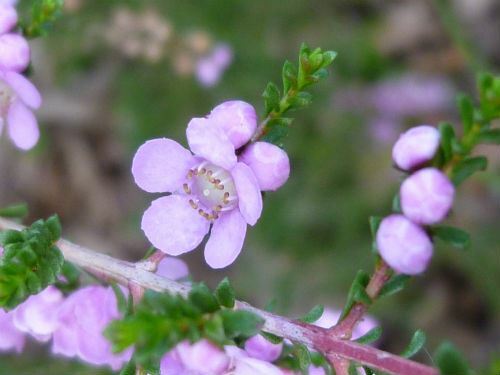 Thryptomene baeckeacea is one of the myrtle family and has profuse tiny pink or white or pinky mauve flowers in clusters from May to October, as well as spot flowering during summer and autumn. When purchasing this plant, it is best to do so when it is flower so you know what the flower colour is. It grows to about one metre high (or a bit less) and about 1.2m wide with a slightly weeping habit. A perfect cottage garden plant for small gardens. The first specimen of this plant was collected by William Dampier in 1699, when he landed at Dirk Hartog Island in Western Australia. The first reference that I could find about growing this plant in the Australian Plant Society journals was in Vol 4, No 20, dated March 1967. So this plant, as with many other Western Australian Thryptomenes, have been in cultivation for many years. 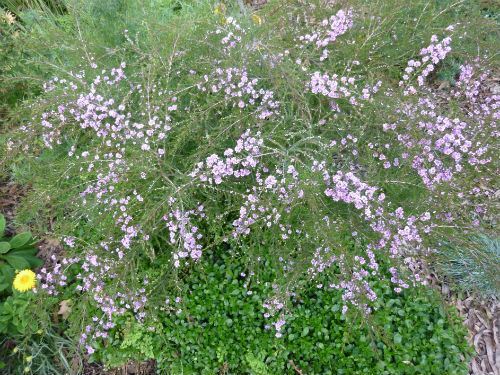 In my northern Sydney suburban garden, I planted my first Thryptomene baeckeacea about 5 years ago and have been impressed with its hardiness, long flowering period and how good the small purple flowers are as cut flowers. I have since planted a few more over the years as they are a very attractive small plant in flower. My plants are all growing in a position that receives sun for only 3 or 4 hours a day and are planted in a thin layer of soil over a clay base. Despite receiving no supplementary water after they were established (except during very dry periods), they all thrive and flower well. 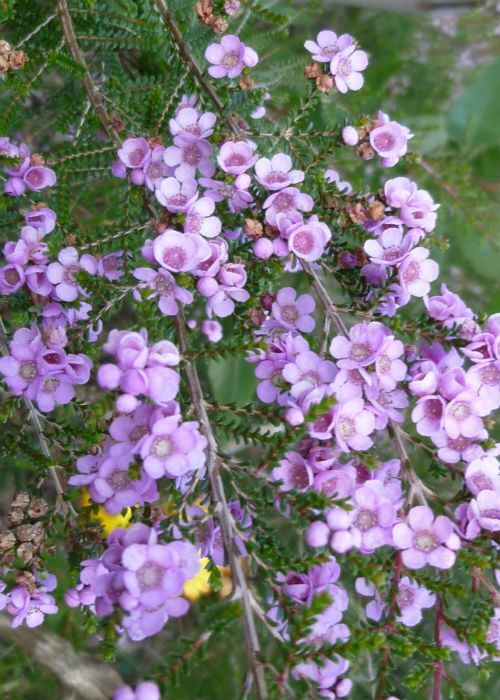 I have been a bit hesitant to recommend this Western Australian plant, as it naturally grows along the coast and inland from Perth, north to around Geraldton and Shark Bay. Over the years, east coast gardeners have found that many (but not all) plants from Western Australia can be less than successful due to the higher humidity and increased rainfall we experience. However, this plant has proved to be quite adaptable and hardy and well worth growing. In terms of maintenance, they only need the occasional prune to keep it in check and keep it bushy. Derivation of Name: From the Greek, meaning coy and prudish; the reason is obscure, possibly referring to its diminutive stature.